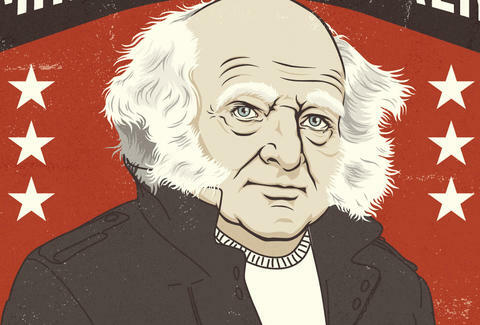 Martin Van Buren was the first politician to utilize a grassroots movement, deploying Andrew Jackson's committee chairmen around the state and organizing volunteers at the local level. "Hurra Boys" would plant hickory trees, in honor of Jackson's nickname "Old Hickory", or hand out hickory sticks at rallies. Van Buren bested Siegfried and Roy by a century when he accepted two tiger cubs as gifts from the Sultan of Oman. He popularized the word “OK”. Known as “Old Kinderhook”, for his New York hometown, he became known by the abbreviation, which he used to sign official documents and correspondence. He was delivered on December 5, 1782, after the Declaration of Independence was signed, making him the first natural-born American to serve as president. 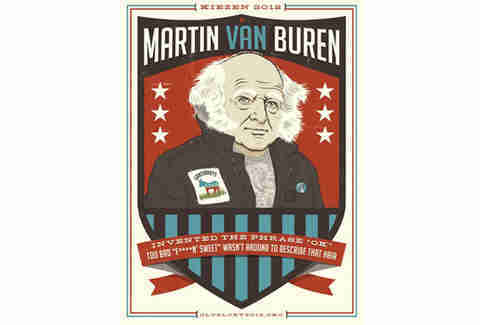 Hoping to win the pro-slavery vote in the year leading up to his reelection, Van Buren sided against revolting slaves in the famous Amistad case. Ironically, he later ran on the “Free Soil” ticket, a party which included many anti-slavery proponents. He lost both bids. He didn’t once mention his late wife Hannah in his autobiography.